It was a family celebration that brought the six of us to the Peloponnese in late September. Thoughts of Greek sunshine lured us too – after a lacklustre English summer. But as the departure date drew near, and the scanning of world weather forecasts stepped up in the hopes of better news, it was clear that the weather in Messenia was set to change. With the equinox, daily temperatures were to drop by several degrees. Now there would be cloud, rain and storm along with the sunshine. Ah, well. Better pack the waterproofs. Yet when we came into land at Kalamata airport on Sunday lunchtime all was blue. The plane banked over the Gulf of Messenia heading out to the Mediterranean before flying back up the Mani peninsula, following the Taygetos Mountains into the airport. Blue sea. Blue mountains. Blue sky. We stepped off the plane into high-summer warmth to be met by Dimitri, who whisked us off in his smart Mercedes people carrier. You have chosen a good time to visit, he said; not too hot. 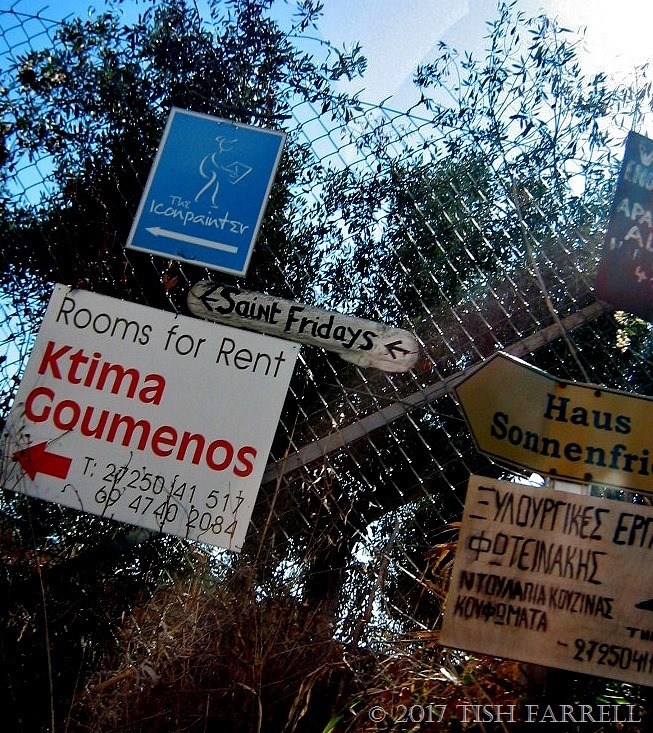 Hinterland Messenia is not pretty. It is a rugged, crumpled upland with deep valleys and winding roads, the vegetation parched from summer heat. Grass burned brown, bare earth between the trees and vines; wherever you look, the grey-green haze of olive groves spreading up and down hillsides and gullies, the dun colour palette spiked here and there: white-walled farmhouses, red tiled roofs, the odd designer villa, black spires of cypress and, at the roadside, soaring clumps of phragmites grasses with their parchment coloured plumes. There is stuff and clutter among the trees – old tyres, beach loungers, broken down farm machinery, dead cars and stranded boats. Ramshackle stalls offer pumpkins and oranges. And then the road bends towards the Gulf and you glimpse the sea, glinting like jewels, the woodcut frieze of the Mani mountains beyond. The road south from the airport to Koroni follows the coast – we pass by Messini, Velika, Petalidi, Hrani, Nea Koroni, Vounaria – more work-a-day farming communities than high-profile tourist territory. We know that when we reach Harakopio we must leave the main road and wend up the hillside above Peroulia Beach. Michael and Maria, our hosts at the Iconpainter’s Villas, have provided a map, but in real life nothing looks straightforward. I’m relieved when it turns out that Dimitri mostly knows where he’s going. The turn is not obvious despite the clutch of signs on the fence, and almost at once we are ‘off the beaten track’ and seemingly in someone’s front yard. The road narrows so quickly I breathe in, and next we’re zigzagging round house ends, nudging round blind corners, Dimitri tooting the horn (not too loudly), then climbing up beside a whitewashed church, then on through olive groves. The road is single track, mostly concrete, but in places broken down to rubble. It undulates with bold intention.There are small ravines and gullies. At one point there’s a frisson of alarm from Dimitri as he fears for his Mercedes. This is no game, he says, and we agree. But he is a game lad, and he presses on. And suddenly we are turning into a smart gateway, pulling up the drive to a tall white house, and there is Michael to greet us and show us to three lovely little houses that will be home for the next seven days. The bright turquoise doors are a good start. In our respective kitchens we find welcome boxes for lunch and the following day’s breakfast – tomatoes, oranges and figs from the garden, Maria’s home-made lemonade and bottled baby oranges, fig jam and chutney. In the fridge there are mini bottles of Ouzo, the Iconpainter’s own white wine, local yogurt, feta cheese and honey. There is also bread, milk, butter, ground coffee and tea, iced water, brown eggs, little fruit pastries, sesame biscuits, plums and bunches of grapes. It seems we have flown straight to heaven. We put out of our minds the fact that on Thursday there will be a big storm, and side line Michael’s apologies that the likelihood of rain is high. We have been longing for it, he tells us. All the olive farmers are waiting. I know it’s not what you want. PS I know I said I’d take you walking to Koroni. But that little trek will have to wait till the weather is cooler. 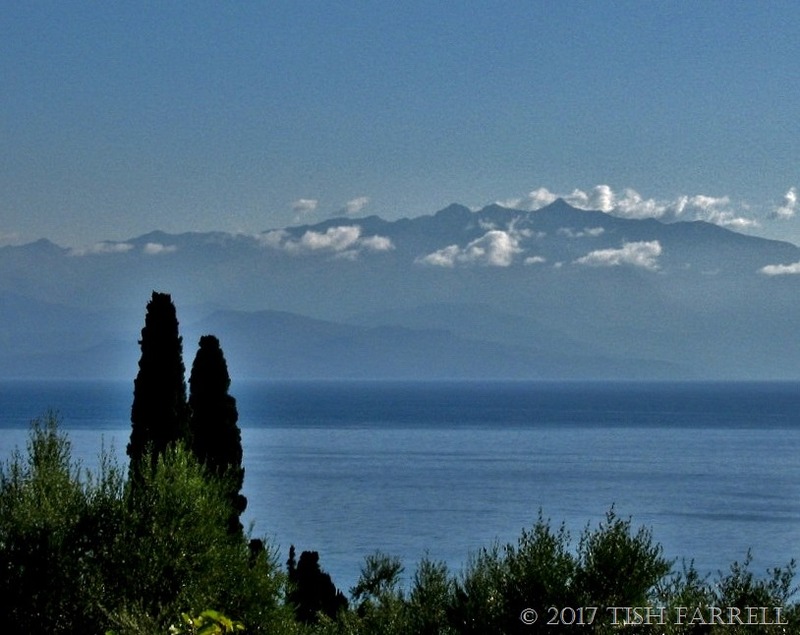 Posted on October 6, 2017 by Tish Farrell	This entry was posted in photography, Travel and tagged Greece, Iconpainter's Villas, Messenia, Peloponnese, Peroulia Beach, Tish Farrell Writer. Bookmark the permalink. Well I am still wanting to go. Beautiful writing. I am enchanted. Lovely. Enjoy, no matter the weather. Oh, what a very bad pun, Janet! We’re just back in fact. And it was our very own Birmingham airport that was the pits with no benefit of olives beforehand. Kalamata was very lovely. You could sit out front and look at the mountains, and wish you weren’t leaving. Aaah! It sounds delightful, Tish. So glad you could go and glad you shared. I’m so looking forward to the rest of this Greek adventure Tish. Your digs sound pretty idyllic. 🙂 wonderful! After the drive you described, uncomfortable beds would have taken the shine off the holiday. it sound wonderful. Reminds me of the Durrell novels from the 1950s. I enjoyed your read so much! Wonderful photos, too , thanks for this share! It seems you haven’t heard from me , lately…. Actually , I never ceased to comment your posts , but WP must have played one of its tricks again ,….. for other bloggers tell me that they ‘re not receiving my news……. Such a cute cottage and oh my what a feast awaited you. It was indeed a wonderful feast. I did think of you, Marina, while were there. We had a totally wonderful time; loved every second. But will learn more than a few phrases of Greek before our next visit. For now, dear Marina, καλησπέρα. What an idyllic place, I can’t wait to see more! Oh, such a lovely story. 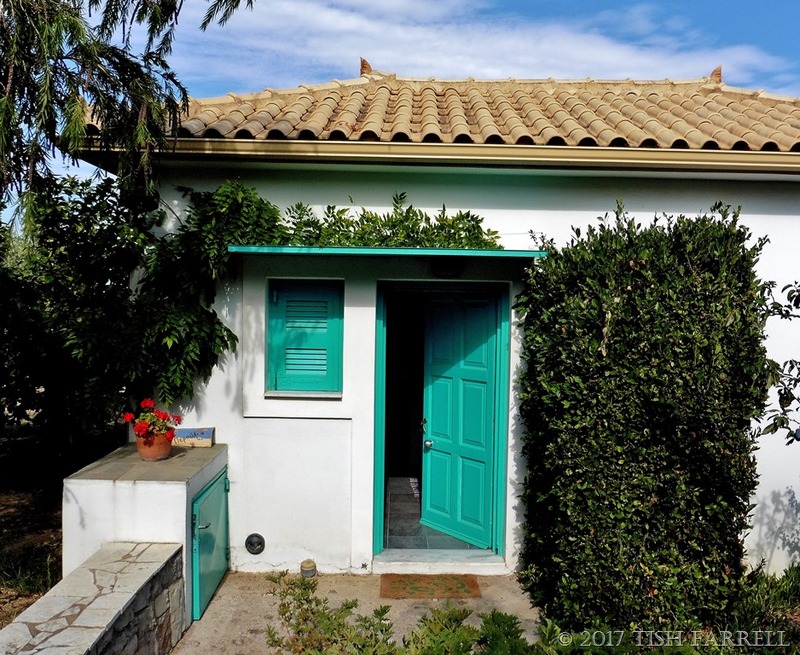 Wonderful photos, especially the house with the turquoise door. How beautifully you draw me in until I can almost feel the summer Peroulian heat, and taste the fresh food. It sounds wonderful, even the tricky journey to get there. Oh, you write like an angel! You capture so many details, and emotions too, from apprehension to sheer delight. I’m conflicted. You make me want to go there, but then you’ve already taken me there. You are so lovely, Meg. Thank you. Lovely writing, Tish! Truly enjoyed this series. What are baby oranges? I like this idyllic setting as depicted by you. Baby oranges – miniature oranges not much bigger than golf balls. I think they may be quite sharp tasting in the raw, but very delicious steeped in a liqueur.